↑ M.A. 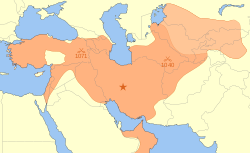 Amir-Moezzi, "Shahrbanu", Encyclopaedia Iranica, Online Edition, (LINK): "... here one might bear in mind that non-Persian dynasties such as the Ghaznavids, Saljuqs and Ilkhanids were rapidly to adopt the Persian language and have their origins traced back to the ancient kings of Persia rather than to Turkmen heroes or Muslim saints ..."
Jackson, P. (2002). "Review: The History of the Seljuq Turkmens: The History of the Seljuq Turkmens". Journal of Islamic Studies. Oxford Centre for Islamic Studies. 13 (1): 75–76. doi:10.1093/jis/13.1.75.